40th Reunion Plans Well Underway!! Friday Night Ice Breaker at Nicole’s in Camden is a free event, with a cash bar for drinks and food. This will be a great place for everyone to catch up and talk to old friends that we have not seen in 5 or more years since our last reunion event. The cost for the dinner banquet has been set at $65 per person or $125 per couple with an early reservation discount rate of $60 per person $115 per couple for reservations postmarked no later than May 3rd. Finally, if you are within a reasonable driving distance of Camden, we highly recommend attending the annual Camden Alumni Association Banquet on Saturday, June 15th at the Camden High School Cafeteria. This event is well received every year, and as the 40th Year Class, it is a good time to make a great showing at the banquet. You will receive a separate mailing from the Camden Alumni Association in late April to make your reservations for the annual banquet at the high school. For around $20 per person, this is a great informal catered event for all alumni & friends. Sad to report the loss of our classmate, Brian Sauer. Apologies for not getting this out to the class sooner, but I only got the notice late Wednesday night, and Thursday was a busy day for me… Hopefully some of you were able to make the memorial gathering at the Grape & Grog yesterday afternoon…. Postcards have been mailed to everyone who either does not have an email address on file or has not responded to my email a few weeks ago to confirm or update your information in our class database. If you wish to confirm or update your information, please click here to do so. 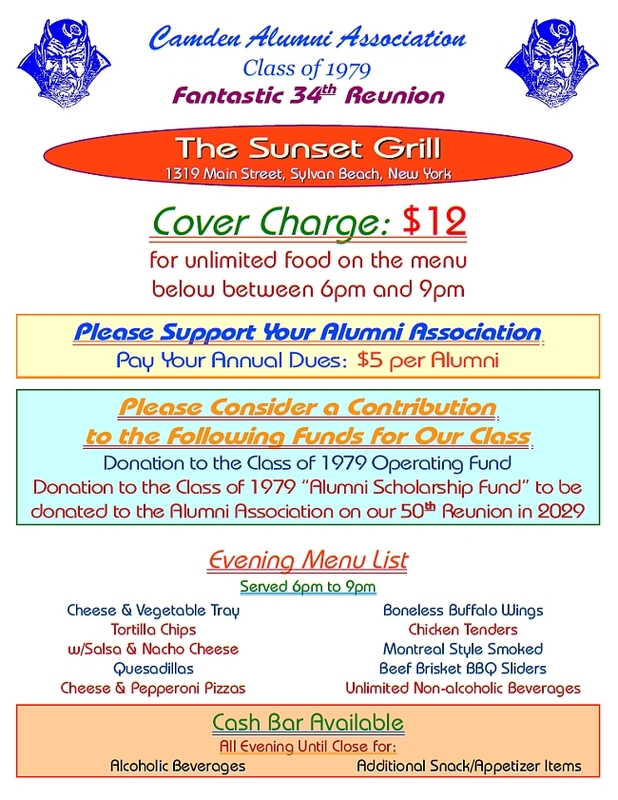 Remember, if you are planning on coming to the 35th Reunion Dinner, you need to make reservations no later than July 18th. There will be no “at the door” payments accepted, advance paid reservations will only be accepted. You can make your reservation payment online by CLICKING HERE. Due to very low responses to the 35th Reunion Dinner Banquet at Delta Lake Inn, we have had to cancel the DJ entertainment. Our reservations have not been sufficient enough to generate the money we need to pay for the DJ, and at the current rate of responses, we highly doubt we will be able to meet the minimum number to cover that cost. We don’t want to wait until the last minute and not give him a chance to book another event, so we are canceling the DJ services now. A couple weeks ago, I sent out an email looking for a classmate to design the cover artwork for the new Class Directory being printed for the 35th Reunion. To date, I have received no replies of interest. If no one steps forward, our only option is to just re-label the 30th Reunion Class Directory cover to apply for the current 35th Reunion. Fortunately, I still have the original artwork files for this cover, and can make this change easily, but I was hoping for something new for this year’s edition…. I have worked on our class site most of the afternoon & evening today, and I think I have just about everything updated for the 35th Reunion in August. All of the information pages are relatively complete, and will be updated as things change. You can find information about all the 35th Reunion Events and updated attendance lists on this website. The attendance lists will be updated regularly once reservation forms start coming in to me…. Shortly, I will look into online registration and payment options, so you can register and pay via PayPal, but I have to do a little research on how to do that from this newer website…. Today, you should receive an email about the plans for our 35th Reunion. The reunion committee is working on finalizing the plans for our reunion weekend over the next few days, and at that time, I will update this website with all the information about our upcoming 35th Reunion. 6pm-11pm: Dinner Banquet at Delta Lake Inn, at Delta Dam, north of Rome. We are looking forward to seeing everyone at the reunion! Look for your information & reservation package in the mail soon! Karen Edwards on News of Interest for Our Class…. Williams Stationery Company Website for Williams Stationery Company. Personalized Letterpress Stationery for individuals and for fund raising.